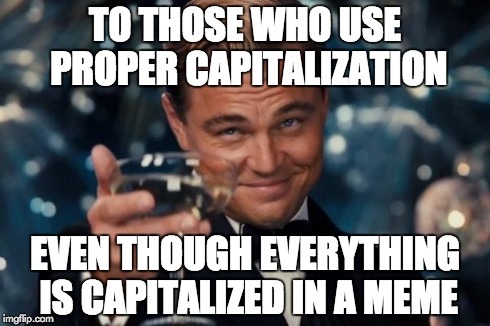 Grammar tips: Capitalization Grammar tips: Capitalization - HGR Inc.
We’ve all seen it and done it in email: gone capitalization crazy. Often, people make many words proper nouns and capitalize things that shouldn’t be. Job titles, for example. WHAT, you say, shouldn’t my job title always be capitalized? Nope. If you’re curious about why, read on. If not, just keep on capitalizing whatever looks good. The first word of a sentence: She can’t remember people’s names very well. Head Chef Barry Butterball or Barry Butterball, head chef, makes great appetizers. My Aunt Mary always brings good gifts or Mary, my aunt, buys gifts. Everyone supported Governor Smith or Everyone supports Joe Smith, governor of Ohio. Jackie works as a videographer. The governor attended the conference. The marketing manager updated the website. Relatives’ names when used in place of a person’s name: My Mom likes the beach. Nicknames that serve as a name: I took Junior to the fair. Geographical regions but not the points of the compass: We live in the Northeast, which is north of Tennessee. He took Drawing 101 because he is majoring in art. He has a bachelor’s degree in mathematics. Seasons if used in a title but not when used generally: He took a course Spring semester but he plans to take a break during winter. One rule of thumb is to capitalize proper nouns, which are the names of specific people, places, organizations and sometimes things.